There are no less than 116 open spaces and parks in Central London. Some of them are large green areas, while others are small gardens. In the City of Westminster, you can find 4 Royal Parks: Kensington Gardens, St James’s Park, Green Park and Hyde Park. The last is the most famous of them all and also one of the largest. In 1851, it housed the Great Exhibition and throughout the years, it was the site for numerous mass demonstrations and protests. 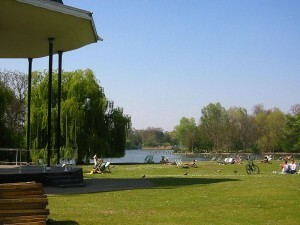 The Serpentine, a recreational lake, divides the park in 2. The Kensington Gardens are contiguous with the Hyde Park, but they are not part of it. The Hyde Park measures 142 hectares and together with the Kensington Gardens it covers a total area of 253 hectares. The Hyde Park Corner is located outside the park. Hyde Park is opened from 5 am till 12 am. The park features a wide array of sites of interest. They include a memorial for the victims of the 2005 London bombings, London’s Holocaust Memorial, the Diana, Princess of Wales Memorial and the Speakers’ Corner. You can also observe various unusual sculptures in the park such as the Broom Broom, resembling a human hand that pushes a toy car, a Jelly Babies family and the Drinking Horse. The Hyde Park has also hosted famous rock concerts held by Paul McCartney, Bruce Springsteen, the Rolling Stones, Queen and Pink Floyd. Regent’s Park is another famous park located in Central London and it is definitely worth a visit. Take a London Stansted Taxi that will take you directly to Regent’s Park so as to have a walk through this wonderful green space. It is home to the London Zoo and Regent’s College. The west, east and south sides of the green area are surrounded by stucco terraces of houses whose design was signed by John Nash. Regent’s Canal runs through the park and it connects the London docks with the Grand Union Canal. Regent’s Park covers 166 hectares of land and it features amenities like a playground for children, sports pitches, a boating area, a waterfowl, a lake and numerous gardens. The London Zoo is located in the northern area of the park. Near the Regent’s Park, you’ll find the Primrose Hill that offers amazing views of the City and of Westminster. Other open spaces and parks that are worth a visit in Central London are Pimlico Gardens, Paddington Recreation Ground, Leicester Square, Hanover Square, Grosvenor Square, Golden Square, College Garden and Brown Hart Gardens. In order to get rail transport from London Stansted Airport to Central London, you have to take the National Rail to Liverpool Street. From there, you will take the Underground service to Bank Station and then you are going to take other tube to Central London. There are also other transfer options such as using a taxi service from Bank, Stansted Airport or Liverpool Street to Central London. So as to travel by car from London Stansted Airport to Central London, you must use the M11 motorway. London Stansted Airport is 42.4 miles away from Central London. A journey by taxi from Stansted Airport to Central London with 247 Stansted Airport Transfer is going to last around 1 hour and 10 minutes. The price for a Stansted Taxi to Central London starts from 58 GBP.